Why has Planet X suddenly become so much more visible? Has its position vs a vs the Earth changed? 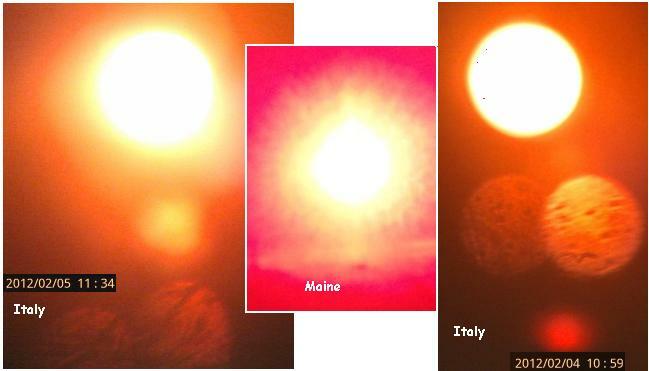 Has Planet X changed position, that it is now appearing at the 6 o'clock position for Europe and the eastern US? 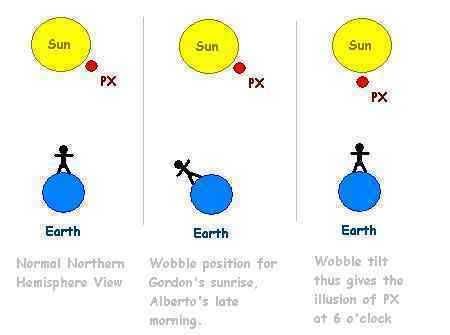 This is due to the tilt of the wobble, putting the viewer at a different angle than when Planet X was predominantly viewed at the 4 o'clock position. But visibility seems to have been remarkably improved! The issue of the continuing cover-up over the presence of Planet X has been brought repeatedly before the Council of Worlds, which wants a balance on Earth so that young souls can weight the reality of their and other's situations. If life is not rosy, but is being portrayed that way, then those who are leaning toward becoming Service-to-Other become complacent, rather than taking action. It is taking action that develops the young soul, so it is taking action that is desired. Thus a decision was made to allow more visibility of Planet X, aka Nibiru, not only on film but also naked eye during the day, to shatter the cover-up over the presence of Planet X. Expect more of this! The World Economic Forum Annual Meeting was held January 25-29, 2012, in Davos-Klosters, Switzerland. Could the Zetas be a fly on the wall yet again and share with us some of the more interesting-yet-secret highlights of this meeting? Was the forum used by the wealthy and power elite to discuss Planet X related matters face to face? [and from another] http://www.weforum.org/events/world-economic-forum-annual-meeting-2012 The World Economic Forum Annual Meeting in Davos has wrapped up. It has been as ever, a cornucopia of intellectual fare, with some 260 sessions on everything from the Secrets of the Universe to Fixing Capitalism, and a cast of the world's intellectual, business, arts, cultural and social giants. It has been a week of superlatives, the most participants, sessions, snow, media coverage - you name a record and we have broken it. In short, The outlook, after a week of intense discussion, is of a troubled world pressed for solutions across a number of fronts, but with optimism provided by human ingenuity and progress. Rather than attempt to summarise or curate, we direct you to the full library of content, videos, summaries, tweets, quotes, blog posts and highlights. [and from another] http://www.weforum.org/members The Forum's 1,000 Member companies are at the heart of all our activities and their support is essential to helping us find truly sustainable solutions to improve the state of the world. [and from another] http://en.wikipedia.org/wiki/World_Economic_Forum The Forum is best known for its annual meeting in Davos, a mountain resort in Graubünden, in the eastern Alps region of Switzerland. The meeting brings together some 2,500 top business leaders, international political leaders, selected intellectuals and journalists to discuss the most pressing issues facing the world, including health and the environment. Unlike the G20 meeting recently, the annual Davos forum has more invitees, and thus there is immense opportunity to talk behind closed doors, face-to-face, about pressing matters such as the doomsday predictions made by those highly accurate Zetas of ZetaTalk. It is hardly doomsday for the common man, who will reincarnate if losing their life and can expect a life in the Aftertime freed from the constraints of debt and political coercion. But for the attendees, life as they know it will end. They will no longer be on top of the pile, in control of money, which will become worthless. When the 2011 Davos annual meeting occurred our 7 of 10 predictions had barely started to unfold. Yes Pakistan along the Indus Valley had sunk by the 10 feet predicted, and yes, sinking had started in the Philippines but not to the degree predicted for the Sunda Plate. Snickering, both from relief and ridicule, was the reaction. But by the 2012 Davos forum the horror of a buckling Thailand with flood waters rushing through Bangkok had occurred, vast parts of Viet Nam and Java were clearly under water and plates everywhere were showing the stress predicted by ourselves. But more than the horror of life as they know it disappearing - the possibility of the very wealthy and their lackeys becoming irrelevant - was the fear of an awakened public. Those who imagined they could slide from their comfortable and controlled life styles into comfortable and secure bunkers are having a rude awakening. The common man is not going to be lulled into ignoring the signs, the Earth changes, and will be demanding answers and to be accommodated! The increasing wobble has placed the Sun and Moon where they ought not to be, and this is abuzz on the Internet, as is the moaning and trumpeting Earth. The Davos attendees had been complacent, assured that NASA and the USGS would hold the curious back by denying the facts and manipulating the data. They now see that something as simple as the greater visibility of Planet X and its components in the sky can shatter anything NASA states, and prove them to be liars. A simple technique, available to the common man, of using a filter FOR red to see the complex cannot be stopped, and the cat is now out of the bag. A single individual, such as Alberto, posting red photos on the Pole Shift ning can create a revolution. They are in panic! After the horror of the breaking cover-up is discussed, and the horror of our predictions coming true in full is discussed, they discuss what to do. They have no options. When it is clear there is a planet between the Earth and Sun, as ZetaTalk has stated all along, then NASA is dead, and the USGS will be ignored as the populace will know when quakes are striking. The status of the Davos attendees will disappear also when cities are imploding, bridges are dropping, and starving refugees are roving everywhere. For the Davos attendees, when they fall silent during such discussions, is the realization that the only solution is to rush to their bunkers early. I understand that the following is all part of the usual shenanigans of the powers-that-be as an attempt to gain greater control over all of us - but it would be interesting to understand a bit more about why they have chosen to speed up the switch from radar to GPS when you and I and, very likely, they know that GPS is going to become a lot less reliable in the the near future. Its like putting a monkey in charge of a running a roller coaster. Maybe worse. [and from another] Congress passes FAA bill that speeds switch to GPS. http://www.boston.com/news/nation/washington/articles/2012/02/06/senate_passes_faa_bill_that_speeds_switch_to_gps/ A bill to speed the nation's switch from radar to an air traffic control system based on GPS technology, and to open U.S. skies to unmanned drone flights within four years, received final congressional approval. Instead of time-consuming, fuel-burning, stair-step descents, planes will be able to glide in more steeply with their engines idling. Planes will also be able to land and take off closer together and more frequently, even in poor weather, because pilots will know the precise location of other aircraft and obstacles on the ground. Fewer planes will be diverted. This bill primarily has as its goal a reduction in fuel usage, as the process of landing and taking off will speed up. Where awareness of the presence of Planet X, and the likelyhood of a passage is increasing, what is passed around, secretly, is sketchy. The rumors refer to government sources rather than ZetaTalk, and seldom cover the detail that we provide. Thus, looking at the short term, legislators are concerned about war in the Middle East which they assume will occur during the End Times and will result in a fuel shortage in the US. If the bill passes and is implemented, this will ultimately mean more chaos at airports as the wobble worsens and satellites fail. There have been an increase in shootings in Australia lately. http://news.smh.com.au/breaking-news-national/sydney-shooting-linke... Reading between the lines it seems there could be tighter controls on gun laws as a result. Australian gun laws came into existence after a massacre at a cafe Port Authur, blamed on a young introvert Martin Bryant. This massacre was extremely controversial, in that there was suspected covert operatives involvement to achieve the result. Two Questions: do the Zetas know if there are plans in Australia to disarm or restrict the public even more, i.e. remove registered firearms from those that legally have them, leading into the PS?, and can the Zetas confirm the suspicions of the public about this massacre and who was behind it? [and from another] http://www.citizens4freedom.com/Articles/tabid/1387/ Secretary of State Hillary Clinton is pushing for the United States to become a party to a global gun control law proposed by the United Nations. And President Barack Obama appears to be sympathetic. The goal of the treaty is to come up with internationally recognized rules governing the trade of guns and ammo. The United States is the world's largest exporter of arms. [and from another] http://www.jbs.org/legislation/un-s-arms-trade-treaty-endangers-your-right-to-bear-arms The United Nations is planning on its Arms Trade Treaty (ATT) being finalized in 2012. The biggest arms suppliers are the United States, France, Belgium, the Czech Republic, Germany, Slovakia, the UK and Italy. However they ignore the worst transgressors of illegal trafficking like Russia and Albania. The United Nations has been pressing for a universal gun control treaty since 2006, but consensus is hardly in sight nor will it be achieved. The reasons for dissension are many as there are many agendas at play. Revolutions are started and supplied by an infusion of armaments, as the recent revolution in Libya shows. If a war is to be avoided, or if the current government is to be overthrown, then the locals are given guns. Another agenda is the profit motive, as manufacturing and selling armaments is lucrative. The client list is endless, with governments wanting armaments to defend themselves topping the list. The argument is that if a country such as Saudi Arabia can defend themselves, then no need for the US to have a base there and do it for them. Thus sales to wealthy countries proceed. Later, should that country be considered to have gone rogue, then more armaments can be sold while the rogue element is countered. Sales all around, on all sides. Then there is the black market element, which would only increase if arms sales were to become illegal. This is quite evident from the police reports, as criminals forbidden to own arms have no problem arming themselves on the black market. The UN has had a focus on arms sales not because they think they can suppress the sale of arms beween countries or the arming of rebellions under a UN mandate to assist, but because many of their member states are concerned about the coming chaos during the Pole Shift, and what this might mean in the Aftertime. What has proponents of individual liberty "up in arms" is the focus on controlling small arms sales. Governments are concerned about being able to keep control of their populace, when starvation will induce riots, and the "have nots" are inclined to invade the enclaves of the "haves" for looting and the takeover of supplies. None of this is likely to be settled, with all the agendas afoot, and thus the Last Weeks will arrive with the situation much as it is today, under discussion. The earthquake more than 10 times happened on 2012/02/06 at Negros - Cebu Region, Philippines - two earthquakes big M6.7 and M6 and the aftershocks. Does this show that Mariana plate leaned? What does it mean for the Mariana and Philippine plates to tilt and fold? The plates are unevenly shaped. Is there evenly spaced subduction on the western edges, or are there points where more or less pressure is applied? Having the Marian Trench collapse is an easy concept to understand, as this is like a clam snapping shut, a simple shuffle of the undersea land to the west. Even though the trench is not a straight line, curving toward the west as it curves southward, it would seem that moving the entire Pacific plate east of the trench a bit to the west would simply close the trench. The islands dotting the eastern side of the Mariana Plate find water heaping on occasion during this process, which the buoys lately have shown is occurring. While the Mariana Plate may have its angle of slope toward the west somewhat altered, this is excused by the populace on the Mariana Islands as the tides are washing their shores, and tides can be erratic. The eastern edge of the Philippine Plate, which is merely an undersea ridge, also gives little evidence that the angle of drop toward the west, the slope, has increased. But the western edge of the Philippine Plate abuts the land masses of the Philippine Islands, and during the folding process must drop, and subduct, to accommodate the compressing Pacific. This forces the Philippine Plate under Taiwan, under the island of Luzon, and under most of the other Philippine Islands. Taiwan and Luzon are assumed by man to be residing on the Philippine Plate, but as we have explained they cling to the plates to their west, and do not sink while the Philippine Plate tilts and folds. A year ago David Cameron hosted a meeting of Baltic leaders to discuss the EU tsunami, commented on by the Zetas He has not only hosted another meeting recently but attended a second in Sweden within a month of the first. Can the Zetas comment on what these meetings are producing, a year later, from the discussions being had? If they meet once then have to reconvene less than a month later, surely they must be achieving something in terms of making decisions? [and from another] http://www.guardian.co.uk/politics/2012/feb/09/david-cameron-nordic-goliaths-sweden Less than a month after hosting a British-Nordic summit in Downing Street which would have baffled previous Conservative prime ministers, David Cameron was in Sweden attending a Nordic-Baltic summit between Sweden, Denmark, Finland and Norway and their ex-Soviet Baltic neighbours Estonia, Latvia and Lithuania. This is indeed a work in process, with the initial proposals and concerns moving to action plans. Latvia has now been included, at the insistence of her neighbors. The focus is on commandeering enough boats to move refugees fast enough to avoid what would be termed a "humanitarian crisis". The European tsunami as described by ourselves would primarily devastate the UK and Denmark. The solution for this swath is advance warning from buoys and ships at sea, a network that has also been the focus. Any serious New Madrid activity in the US will put this network on high alert, and any sign of tsunami waves will bring a screaming alert to the UK and Denmark. Moving the populace inland in the UK, and to Sweden or onto boats in Denmark would be initiated immediately. These exercises may be repeated, if called too early in the 7 of 10 process, but will be considered good preparation for the real thing. Those counties that will suffer less during the European tsunami are expected to likewise move their coastal populations inland to safety. Frankly, the issue of rising seas in the Aftertime is not being discussed, as preparations for the tsunami is more than the participants can handle. The current plan is to return refugees from the UK and Denmark to their homelands, when the tsunami waters drain. Of course this is not an ultimate solution, but all are avoiding any talk of further crisis. Scientists employed by the governments have confirmed our analysis of how the North Atlantic would react to a release of the bow tension in N America, which is evident for all with eyes open. They know the tsunami is coming.